Living in the nuclear shadow of Rocky Flats. Rocky Flats. The name doesn’t mean much to most Americans, or even most Coloradans. But it should. Over the course of four decades, the plant, located approximately fifteen miles northwest of Denver, produced more than seventy thousand plutonium pits (i.e., triggers) for nuclear weapons. The problem is that safety was never a top priority at Rocky Flats, and as a result, plutonium and radioactive waste was improperly handled, stored, and even lost. Worse yet, two fires—one in September 1957 and the other on Mother’s Day 1969—resulted in plutonium contamination, which reached many miles beyond the boundaries of the facility. In “Full Body Burden” (Crown)—which is part memoir and part investigate exposé—Kristen Iversen describes growing up within sight of the secret plant, and explains the impact it had on surrounding communities, both from an economic and public health perspective. 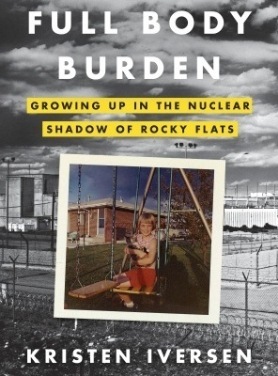 Iversen, who worked at Rocky Flats in the 1980s, also recounts the government’s sustained attempt to conceal the effects of the radioactive pollution, as well as the challenges experienced by former workers and area residents, many of whom have attempted to seek compensation for their cancers and illnesses, which they attribute to the contamination. Growing up, how close did you live to Rocky Flats? When I was a baby we lived in a house in what is now called Old Arvada, and that was about seven miles from the plant, very much within the contamination zone. But when my father’s law practice started to do a little better my parents, pursuing the American dream, built a house in one of the new subdivisions around Rocky Flats. We were one of the first families to move out there. Our house was about three miles from the plant and we could see the water tower from our back porch. At night we could see the twinkling lights of Rocky Flats on the horizon, and it was fascinating, kind of like a secret city. Of course, it wasn’t a city at all. Was your family aware of—or worried about—what was going on there? No, [but] my parents did have to sign a form. For a short period of time, if anyone wanted to get any kind of HUD [Housing and Urban Development] financing, the government required builders to disclose that there was contamination in the soil. But they were not informed as to what Rocky Flats was or what it was doing to the environment, or perhaps most importantly the level of risk it posed not just to local residents’ health, but the fact that it was also a prime target during the Cold War. The form said there was contamination but that it was nothing to worry about. One of the greatest ironies of my story is that my parents thought they were raising four children in an idyllic environment. Why was Rocky Flats situated so close to a metropolitan area? It was a mistake. The original engineering reports for Rocky Flats depended upon wind patterns at Stapleton Airport, on the other side of Denver. A Rocky Flats employee by the name of Jim Stone pointed this out very early, but his memo was ignored and they went ahead and located it on the high plains. The problem with the wind patterns there is that the chinook winds come down off the mountains and fly across that site like a roaring locomotive. Our house would rattle and shudder. Of course, those winds pick up all the contaminants at Rocky Flats and carry them over the Denver Metro area. The other thing is that Rocky Flats needed a lot of employees so they located it close enough [to Denver] so that they could count on a steady supply of workers. Arvada, Boulder, Golden, Broomfield and Westminster: All of those were—and are—contaminated. Tell me about the September 1957 fire and the contamination that resulted? When that happened very little was known about Rocky Flats; it was still operating under the cloak of Cold War secrecy. But that fire was one of the greatest accidents ever to happen in the United States with respect to a nuclear facility. We will never know exactly how much contamination was released because records were poorly kept, no information was released to the public, and the measuring equipment was destroyed. What about the Mother’s Day fire in 1969? There are several significant things about that fire. The first is that we came very, very close to a disaster of Chernobyl-like proportions. But that fire was very similar to the 1957 fire; basically the same thing happened in terms of a spark in the glove boxes in a plutonium production building. Again there was a radioactive cloud, and that cloud traveled a very similar path over the Denver Metro area. On May 11, 1969, I was eleven years old and my family was having Mother’s Day brunch, like most families in the area at that time. While we were having brunch a radioactive cloud was traveling over our heads and we had no idea. Also, the 1969 fire occurred in two interconnected buildings; one building was single story and the other had two stories. Fortunately, I guess, the building that was most heavily damaged was the two story building. The fire could not be contained and the roof began to melt and started to rise, almost like a marshmallow bubble. It came very close to having a breach, and the only reason that didn’t happen is that the firefighters who went up on the roof used water to try to cool it down. They were very nervous about that because you can’t use water on a plutonium fire without creating the possibility of a criticality or nuclear chain reaction, but they didn’t have any other options. The other thing is that at one point one of the fire trucks hit a power pole, knocking out the electricity. When the fans in the building [that were feeding the fire] stopped turning, things began to cool down. But we came within minutes or possibly seconds of having a Chernobyl-like accident. Have the contractors who operated Rocky Flats been held accountable? Not in my opinion [laughs]. The Price-Anderson [Nuclear Industries Indemnity] Act is a piece of legislation that largely indemnifies private corporations from any liability in the case of a nuclear accident or incident. No one likes to use the word accident in the nuclear industry; they prefer the word incident. The Act is intended to protect the companies; otherwise they would not want to produce nuclear weapons or build nuclear power plants because it is very risky and dangerous. But the Price-Anderson Act is also supposed to help protect citizens. My feeling is that the courts have not done a very good job of providing citizens with any kind of compensation, or even recognition that their health and their lives have been put at risk and that we’ve had to pay a cost in terms of public health. What about the plutonium that was lost at the plant? When I was working at Rocky Flats I typed reports that went to Washington and Albuquerque and other Department of Energy (DOE) sites around the country. I was dealing with a lot of acronyms, most of which I didn’t understand at the time. And I was told that I didn’t need to understand them. One of the most surprising acronyms was MUF—missing and unaccounted for plutonium. That refers to the amount of plutonium that was lost at the plant. In 1995, then-Secretary of Energy Hazel O’Leary confirmed that more than three thousand pounds of plutonium had been lost. And there are indications that it was, in fact, more than that. Where did that plutonium go? A lot of the material was moved underground, so some of it was lost in that way. But in 1989, they found sixty two pounds of plutonium—enough for at least seven bombs—stuck in the pipes and ventilation in the plutonium processing buildings. Workers had become so frustrated with how the vents would get clogged that they would take screwdrivers and poke holes in them to keep things moving. The DOE says that some of the three thousand pounds was due to administrative error—that they didn’t keep track of it well enough. I’m not sure that is reassuring [laughs]. What led you to begin working at Rocky Flats? I went to work there because I was a single parent with two kids and it was one of the best jobs in town. At the time I trusted the government and the corporations that ran Rocky Flats to be transparent and honest about whether or not they were putting our lives—and my life in particular—at risk. I was also enormously curious about the plant. I wanted to get past the gate and the guards and see what it was like inside. I grew up not really sure what was going on out there. The rumor in the neighborhood was that they were making household cleaning supplies. For years my mother thought they were making Scrubbing Bubbles®. Some people thought they were making glass doorknobs. There were all sorts of rumors and some of those rumors were intentionally put out by people who worked at Rocky Flats, because they were not allowed to talk about what they did. But once we began to become aware—or more aware—what was going on there, there was a sense of bravado in my neighborhood: This can’t hurt us. We grew up with it. There were also a lot of jokes, like the joke in my family is: Rocky Flats is why we all have such glowing personalities. But even when I worked there I did not know the extent of the problems, and that I was working next to fourteen tons of plutonium, much of it unsafely stored. What prompted you to stop working there? One evening I got off work and fixed supper for my kids and gave them their baths and put them to bed. Then I went downstairs and made myself a cup of tea and turned on the television. Nightline had an exposé on Rocky Flats, and they were interviewing people that I worked with—like Mark Silverman, who was the DOE manager at Rocky Flats at the time. Silverman was one of the first—and certainly one of the few managers—who was upfront. He said: We have all this plutonium, we don’t have anywhere to put it, it’s not safely stored, we are endangering lives and we are contaminating the environment. I was stunned. I’ll never forget that moment. My heart sank. I thought, How could I not know this? How could I grow up next to it and not know how bad it is? I was worried about myself and my children. I went to work the next day and knew that I would quit. And the day I quit was the day I knew I would write a book. What kind of health problems have you suffered? My siblings and I have all had issues like immune system deficiencies and chronic fatigue syndrome. I had a scare with lymphoma, and my sister Karma has had several bouts of cancer. My brother has rheumatoid arthritis. I have spots on my lungs yet I’ve never smoked. Is that related to Rocky Flats? Perhaps. My doctor thinks it very well could be. But we’re very lucky compared to other families in the area. One of the women I write about in the book is Tamara Smith Meza. Her family lived just down the road from us, right on Standley Lake, directly downwind from Rocky Flats. They grew their own vegetables, lived off the land, and raised their own cattle for meat. All the kids in the family have been ill but Tamara has been very ill and just had surgery for her eighth brain tumor. What is the difference between my family and their family? We never had a well on our property. They have a well that dips right into the Standley Lake water table, and I think that made a difference, sadly. It’s fascinating to look at how Mayak [near Chelyabinsk, in the Soviet Union, which also produced plutonium pits] compares to Rocky Flats. They had similar accidents at almost the same time. Some of their accidents were worse than those at Rocky Flats so there was more damage to the local environment. Yet in some ways people knew more than what we knew in Colorado, which is surprising, because in Russia they did not have a free press. One of the things I find most troubling is the government doublespeak that goes on in that they will say there is no safe level of exposure to plutonium … but don’t worry about the plutonium in your backyard; it’s at a level that we consider to be safe for you. It seems like what happened at Rocky Flats has already been forgotten. Do you think most Coloradans know about or remember what happened there? It’s stunning to me how little people know about Rocky Flats. If they know anything at all they think it’s a historical story that doesn’t have any relevance to the present day. Of course, that’s not true. We are still seeing health effects and high rates of cancer. I have been hearing from hundreds of people who live around Rocky Flats and other nuclear sites who have had cancer or health effects or have had a family member who has died. And then there is also ongoing controversy about the Rocky Flats National Wildlife Refuge. A great deal of contamination remains in the soil. Plutonium has a half-life of twenty-four-thousand years; it’s going to be there for a long time. How do people who live near Rocky Flats feel about being so close? Rocky Flats is located in a very beautiful part of the country and it’s always been an area of high growth and development. And there are a lot of business interests in home building, and that industry in particular has not been eager to tell people that the soil is contaminated. The advisory notice that I mentioned earlier that my parents had to sign, they did away with that when Ronald Reagan came into office. So people who buy houses there, even to the present day, do not know that the soil is contaminated with plutonium. But the ones who do know, they feel very conflicted. There are some who would rather look the other way. I know people like that; there were people like that in my neighborhood. To understand what happened is to consider the fact that your own health—and property—is at risk. And there is no way to get any type of compensation from the government or anywhere else. What is the site being used for today? More than thirteen hundred acres are so profoundly contaminated that they can never be opened to the public. That part of the site is still managed by the DOE. The rest of the site—more than four thousand acres—is now managed by the Fish and Wildlife Service and is slated to open as a national wildlife refuge and public recreation area. They have plans to build hiking and biking trails. Many people think it should be declared a “national sacrifice zone”—that it is so profoundly contaminated and that the levels of plutonium are so uncertain that it would be foolish to allow people to go onto the site and use it for public recreation. But there is a lot of pressure on the part of local politicians and home builders who would love to be able to say, “It looks pristine, so it must be okay.” But there’s a lot of bad stuff there. What kind of feedback have you received about the book? Sometimes I hear from very vocal pro-nuclear weapons and pro-nuclear power people who respond in a knee-jerk fashion. They are very antagonistic toward me without reading the book. But most of the response has been from readers who find the story moving, and are astonished that they haven’t heard the story before. I’ve also heard from people who work for the DOE. I received one long email in particular from a man who worked at Rocky Flats, Hanford, and Chernobyl and now he’s working in recovery operations at Fukushima. He said: You got it right and this is a story that needed to be told and thank you for telling it. Disappearing Ink—The rise and fall of handwriting. 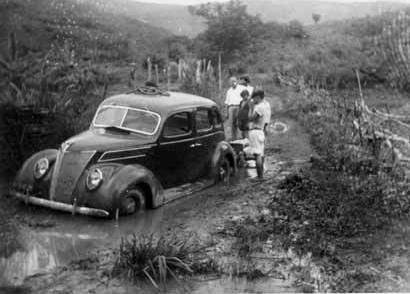 Fordlandia—The rise and fall of Henry Ford’s forgotten jungle city. Beautiful Day—Could a proposed national holiday help revitalize American democracy? Edsel: An Auto Biography—Failure magazine examines the history of the Edsel.